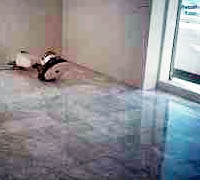 If every day wear and tear has moved the luster from your marble floor it's time to call Cleaning Doctor for special Marble crystallization programme. Conventional marble renewal programme is done by using diamond coated disc pad to send the marble to produce the desired sheen. But now there is a new system (marble crystallization programme) that will leave the marble sparkling like new, but it is much less abrasive. It's dust free, it's fast and produces result so stunning you'll be amazed.